. Even if you’re not trying to figure out how to cut heating bills, it’s fascinating to read about people living in a cold house on purpose. I am a winter hater. As I mentioned on my last post, I have a hard time with winter . Part of this has to do with seasonal affective disorder. The other part is just that I hate being cold . HATE. Loathe .Despise. I’ve spent the last month trying to make our 1825 rented homestead as winterproof as possible. Just when I think I have all the cracks and holes stuffed or plasticked over or covered with an old blanket, a strong wind will blow outside and I’ll feel another area that needs attending to. There are drafty spots where I clearly feel air blowing at interior walls even. Maybe a freemason built this house and behind the walls are hidden chambers for masonic rituals. Not cool, imaginary freemason dude. It’s hella cold in this house. BUT only when the wind blows. Otherwise, the woodstove keeps the house pretty toasty. First we were given a list of wood vendors who accept HEAP. It is fairly easy for someone who sells wood to accept HEAP but not everyone does it. Calling through the list was frustrating. I’d either hear that they didn’t have wood, they have wood but not seasoned, they have wood but they won’t deliver… or if they would deliver, we were out of their delivery range and wanted to charge quite a bit. Then I found, “Yes, we have wood and we’ll deliver but it’ll be a bazillion dollars for less than a cord of wood. 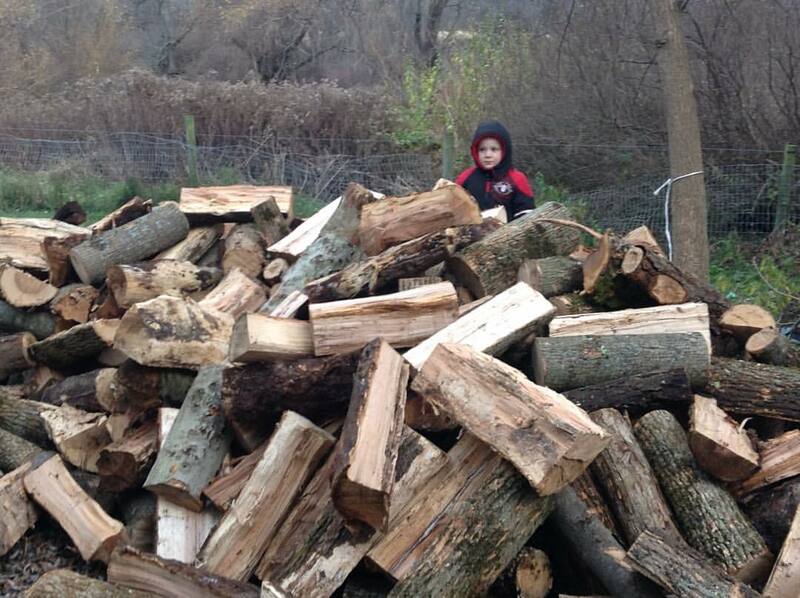 FYI: Less than a cord of wood isn’t going to get us far in NY winter. Also, less than a cord of wood should not cost a bazillion dollars. Interestingly, if I checked this company’s wood prices for non-HEAP customers, they were way less than a bazillion dollars. Clear price gouging to low income folks. Nice job,guys. Basically,there’s a certain amount we’re granted for HEAP and if we had gone with one of these wood vendors, they would have taken our entire HEAP benefit and given us very little wood. So, we decided to have our HEAP applied to our electric bill (we have one bedroom in the house that is kind of separated from everything else and stays cold, so we’re using an electric space heater in there and also in the dining room because it’s actually an enclosed porch ) and found a local guy on craigslist who just sells wood as a hobby. $150 for 2 face cord. Delivered. It will last for a bit before we need to hunt down someone else with wood. Yay, we got wood. It’s all stacked nice and neat now. It’s a little weird how much I LIKE to stack wood. I’ll also be really honest here and tell you that I have an inner 12 year old who could not help but find it hilarious every time I had to ask a guy over the phone if he had wood and if yes, could he deliver. Ok,maybe not hilarious but amusing. I was amused. It’s the little things that help me through. Also, an acquaintance who lives in the area has been trying to clear trees from his property to make an actual yard and do landscaping. He offered it to us for free as long as we could haul it away. Some of it’s still green and needs to season but it’ll be a good source. Our cute little 2 door car wishes it were a rough and tough pick-up truck so we do everything we can to make it’s dreams come true. 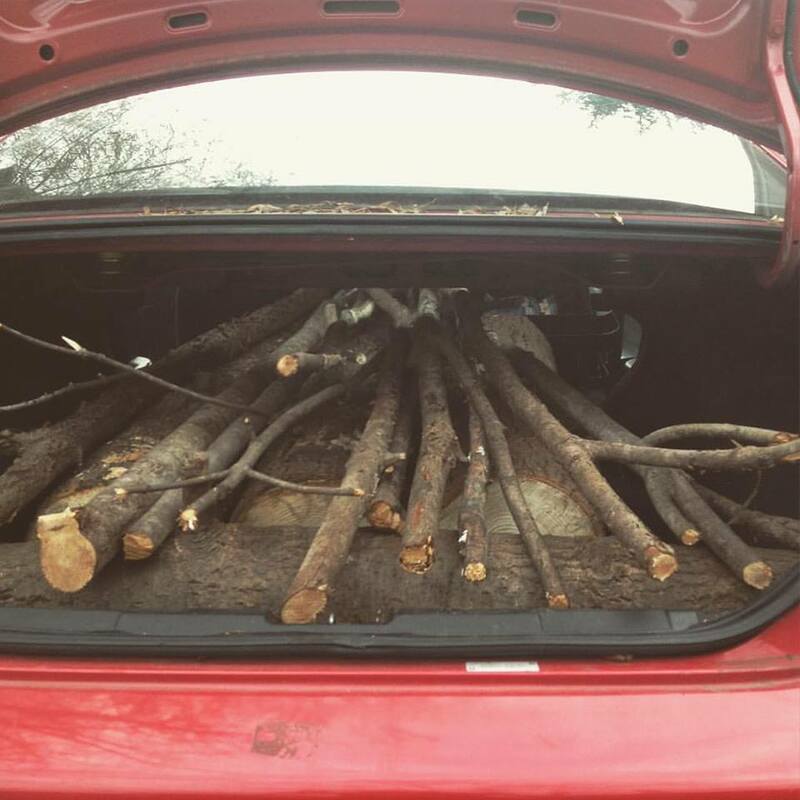 We can cram quite a few logs in there with the back seat down. The good news is that I’m not AS nervous about winter as I was back in September.We aren’t going to freeze. High five to the man with wood who could deliver. Previous Previous post: Recommend to me…. Our funace has blown.. not literally, but it cant be fixed anymore. ( we are on the weatherization list who knows if and when we get on tp) Luckily, hubby had heated his garage with wood and did have some. It had to be recut. I ponied up for a used woodheater, and so far with some minor setbacks, it is working well.For $50 it wasnt a bad inveestment, an it came with all the piping we just had to make it so it didnt catc the house on fire and set it on cinderblocks. One day we had smoke pouring out of the vent and door- thank God it happened during the day or we would be dead literally. Our house was built in 1900. Not much younger than yours- I get staatements from the electric/gas company all the time telling us we are overusing compared to other houses this size (no its not big) It is drafty. Period. I am praying we have enough wood. I got LiHeap for gas and electricity before the heaterr puked out. I havve split more darn wood than you even want to know about … and I am sure the neighbors are convinced not to mess with me because I get ticked off and goo out and split wood for hours. Hubby cant split he has too many health problems happening. I have gotten quite good at splitting and stacking. I hate winter andd last week it snowed 12.7 inches. 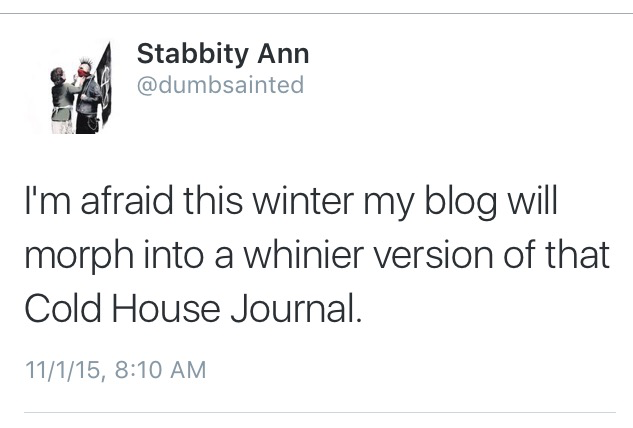 If I had a blog and gave a tinkerrs darn about typos I would have a weekly or daily cripe session about being cold too. AAARRGGHH …winter, in the UK we have first snow this week , our cold isnt in the league of the USA but its bad enough , our timber framed council owned 1950s has only oil heating , single glazing and a big mould problem. Oil prices have dropped like a stone , so this year we have some oil but because my partner is now pretty much immobile he constantly feels the cold , usually we have an hour in the morning and an hour at night , if it doesnt last till spring we are buggered , the heating is ancient and it has to be on or off no heating a single room you have to heat the whole house . Its a beautiful place to live in the summer , but in a winter you just wish you were dead . We made a last minute move this year, saving us from another winter season in the “renovated” barn we spent the last 3 years in. We live in western NY, too, up near Brockport. Last winter was the first for my baby son, and we didn’t want another repeat in such a cold house. 1, MYSTERY drafts. The ones that don’t disappear after all the windows have been double plastic-ed, and cracks dutifully stuffed. 2. The concrete floor! There was a mere thin layer of subfloor and stick on tile between our feet and a concrete slab that ran under most of the first floor. It was awesome in the summer for keeping our place cool as a cave, but miserable to try to battle in the winter. 3. Mystery Roommates. I strongly suspect squirrels, but we only ever caught mice. If you have ever tried to trap squirrels, you know how hard it is. The landlord provided a couple of traps and shrugged his shoulders. I am super glad we were able to replace the oil heater with a gas furnace our first winter, or we would have been dealing with that hassle like the person with the comment from the UK. And even more glad we got out of there this year. I have had a few folks that didn’t understand why we would live in the old place when it was so inefficient. They tended to be homeowners who hadn’t tried to find a rental in ages. If you can’t afford $900 – $1,000 a month, finding appropriately constructed and seasonally sound rental property is an arduous task. Families and individuals in rental markets with hard winters face challenges on top of those shared by renters in all areas, and I sincerely hope you and your family can keep warm this winter.